On the last day of the festival (Friday, October 17, 2008) Mireille Perron’s art history class including myself, ventured down the hill from the Alberta College of Art + Design to the 809 Car Port in Sunnyside where artist/ environmental programmer Kelly Andres was stationed with The Urban Habitat Laboratory. 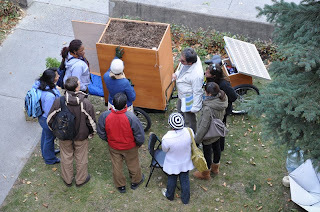 The UHL is a self-sufficient, sustainable and mobile apparatus from which Andres collects sound specimens from trees and plants in urban environments. Moving slowly through the neighborhood streets, Andres gathers audio samples with her laptop, powered by a solar panel on the back of the mobile laboratory unit. After the samples have been obtained, she constructs them into a map. “An artist’s job is to be critical of [their] space,” says Andres, who spends her days steadily observing a single location in plant time (which is much slower than people time). By practicing audio cartography Andres creates new and innovative ways for the audience to not only reconsider how urban space is constructed, but also causes them to re-evaluate their relationship with plants. As she was explaining the process of collecting the noises and voices of the trees, we became increasingly curious to find out exactly what sort of noises a tree could make. Andres led us into the back ally behind 809 to find a tree but surprisingly, there were very few large enough so we settled on a dead tree stump protruding from the cracked black pavement of an apartment building parking lot. Andres gently placed the contact microphone on the side of the tree stump and carefully wrapped an elastic bandage around the stump to secure the microphone. She then passed around headphones so each one of us could take a listen. While one woman described it as sounding “like [her] husband’s stomach,” I maintain that a dead tree stump sounds like organic static with a pulse. The static very well could have been blamed on microphone interference however it was difficult to decipher if the low pulsing sound beneath the static was coming from the tree or from Andre’s fingers that were firmly pressed against the contact mic. Perhaps the most interesting part of this experiment was not just listening to the rest of the world through a deceased stump but the fact that such large group was gathered around the stump, fully willing to listen.